Comprising a pair of wireless earphones styled in break blue, the Beats by Dr. Dre Neighborhood Collection Powerbeats3 power onward for up to 12 hours off a single charge. In a pinch, you can charge their on-board Lithium-Ion battery for five minutes to give you one hour of playing time. They feature secure-fit earhooks and a sweat- and water-resistant design optimized for workouts in particular, and life in general. The presence of Apple's proprietary W1 chip makes the process of pairing as painless as placing the product in proximity to your phone and powering it on. They can simultaneously pair with your Apple Watch, iPad, and Mac, provided you have an iCloud account, the proper operating systems, and all of the aforementioned products. The Powerbeats3's ergonomic design ensures a clear and dynamic sound, while the microphone and RemoteTalk function allow you to answer calls, play music, adjust volume, and talk to Siri from time to time. The earphones come with an included charging cable, a carrying case, and four sets of eartips to fit any shape of ear. Note: You must have macOS Sierra, iOS 10, or watchOS 3 for simultaneous pairing. 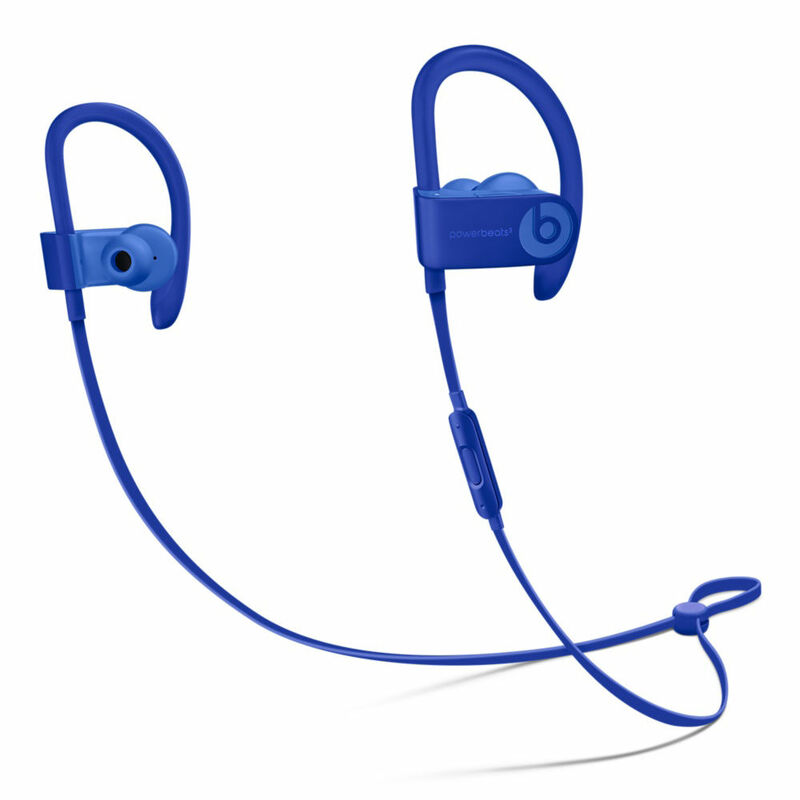 Box Dimensions (LxWxH) 6.142 x 5.118 x 2.756"
Neighborhood Collection Powerbeats3 Wireless Earphones (Break Blue) is rated 4.2 out of 5 by 64. Rated 4 out of 5 by Michael from Good set of wireless earbuds for the price I bought these to accompany my new iPhone 7 Plus. So far I'm very pleased. I've used them for some travel - listening to music and watching movies on the plane. I've also used them in the gym. It's important for audio quality and comfort to achieve the right fit. I was able to settle on a set of the included tips, but these are not the best fitting earbuds I've had. Still, they feel secure while running. These are also not the best sounding earbuds I've had, but for the price they're acceptable. Set up is incredibly easy. Stupid easy. They've got this down. The battery life is very impressive. Audio quality for calls in both directions it good, too. Rated 1 out of 5 by Brian from Great fit, poor reliability My 3rd pair of beats headphones. They fit well, but will stop working if you get even a single drop of water on them, from sweat or rain. Sometimes they stop working anyways even when dry. Extremely unreliable. This particular unit was difficult to pair, much worse that powerbeats2 which paired automatically when you turned it on. Don't buy these without a protection plan. 100% chance they will break within 2 years, probably within 1 year. You'll need a backup pair of headphones to use when these ones break. They fit really well for running and sport. Rated 3 out of 5 by Anonymous from Nice sound, very overpriced, not great value Overall, I would say that these are entirely too expensive and over-hyped. You're paying for the name, without much in the way of performance that sets these apart from other, less expensive, bluetooth headphones. The sound is nice, very bass-heavy, good volume. Connectivity, Bluetooth performance is fine, but nothing above and beyond cheaper headphones. They are not particularly comfortable, and hurt my ears after more than an hour. I've tried all the bud tip sizes that come with them. The carrying case is ridiculous, and is nothing more than a coin purse that doesn't close, certainly doesn't give me confidence that they are protected. For such an expensive item, a harder case with a zipper closure would be much more appropriate. Overall, the value of the Powerbeats 3 is very low, the performance is fine but nothing to be excited about given the high price. I wish I would have returned them within the 30 day window, now I'm stuck with them. Don't fall for the hype, it's not worth it. Rated 3 out of 5 by Nghia from Average My first pair of in ear bluetooth headphones. I do own (high end) Sennheiser Momentum 2.0 On-Ear Wireless and (low end) Panasonic RP-HJE120-PPK In-Ear Headphone for comparison. I actively use both headphones. I do like the sound of these headphones, but considering how expensive they are (15x) compared to my low end Panasonic wired in-ear phones I was expecting some incredible sound quality improvements, but was mildly disappointed in that respect. They are better, but not 15x times better so either the Panasonics are a really good value wired pair or these bluetooth ones are a bit over priced. Rated 5 out of 5 by Anton from My favorite earphones More accurate high and low end than Powerbeats 1. Pairing to iPhone SE and old iPod very easy. Long battery life, much better controls than Powerbeats 1. Have not tried phone function. For best sound a good seal must be maintained. A poor seal will result in poor sound. Used these with sound controls off. Lite weight and they never fall out. After I bought these I have never used Apple wired earphones again. Rated 5 out of 5 by Anonymous from Great charging speed! Work great and stay charged for a long time! Rated 5 out of 5 by Anonymous from I would recommend this product to friends Everything is great about it!!! They will work fine with the iPod Touch 5th generation, and all other iOS devices. is powerbeats 3 a significant upgrade over powerbeats 2? Differences include: Up to 12 hours of battery life with Powerbeats3, which use Apple's power-efficient W1 chip (vs up to 6 hours of battery life with Powerbeats2).A 5 minute fast charge for an hour's typical use (vs a 15 minute charge).Improved ergonomic design..
will the powerbeats3 work\pair with android or galaxy devices ? No. You must have macOS Sierra, iOS 10, or watchOS 3 for simultaneous pairing. Will this work with android devices? What about the Google assistant? Does this can register in apple websites? I mean, is this genuine product? If i register my powerbeats 3 do I get three free months of i tunes as a limited time? Im not sure if I should buy these BEATS Powerbeats 3 or not. Im seeing a lot of good and bad reviews on them. Should I risk buying them??? I think you should stop thinking about buying it. I got my first pair of these and after 3 months i had issues of automatic disconnecting and i got another one and still another one have same issues with it so i extremely don't suggest you to buy it.